Employees are not happy this year. Why? Cos’ many did not get their increments. According to Malaysian Employers Federation (MEF) salary survey, out of the 212 companies surveyed, only 56% gave out increments this year. It’s a whopping drop as compared to last year at 81%. The figure is not really a shock to many as this had more or less expected due to the economic downturn. Rather, the more pertinent question on everyone’s mind is this: When will the economic downturn be over so that we can have the salary increments and bonuses back? There are signs of recovery in the country’s exports with regional trade picking up the slack from traditional export markets, said Federation of Malaysian Manufacturers president Tan Sri Mustafa Mansur. We all hope for a rising, but the only rising we got so far is the floods on the East Coast. 2010, how is it going to be? Of late, more people are getting into the freelancing bandwagon. Some opted to freelance immediately after graduation and some decided to give it a shot when they are being laid-off, and some freelance merely for the sake of supplementing their fixed income. Whatever the reason one gets into freelancing, one fact remains….it’s getting increasingly popular. Why freelancing is getting more popular? • Companies are wary of hiring full-time workers due to the economy uncertainty. Instead of having to bear the cost of a fixed head-count during slow times, engaging a freelancer helps to keep the overhead low. • The increase of jobs that are pc or laptop-based makes it easier for employers to outsource to individuals. A lot of work nowadays can be done if you have a laptop and an internet line. Correspondences can be carried out online free of charge and work can be easily transmitted through emails. Besides, owning a PC or laptop has become relatively cheaper nowadays making it easier for individuals to opt for freelancing mode. • A change of mindset - freelancing as a new working lifestyle is being embraced more positively than before. In the past, you get frowned at if you do not have a full-time job. But now, people envy the freedom and flexibility of those that tread on this path. • Many freelancers had also testified true job satisfaction and this had persuaded many wannabes to follow their footsteps. 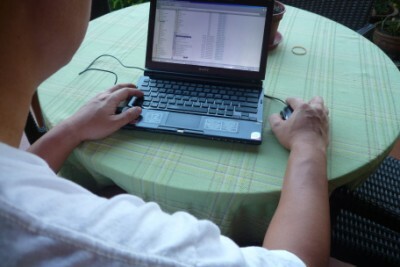 • Freelancing allows people to work from the comfort of their home. With the crazy traffic jam especially in Klang Valley, the idea of earning a living from home is an attractive idea. • Websites that advertise for freelancing jobs or allowing freelancers to advertise their services had also encourage the trend. Any freelancers out there – wish to share your experience? How Do I Protect My Online Reputation? It’s not what you said that determined your reputation but what Google said... This is the world of digital age after all! Almost every professional cannot escape leaving a digital footprint – some of us bigger than the rest but no one is spared from leaving some marks somewhere. As the internet helps a person to be famous very fast, one negative comment can likewise spread quickly beyond our personal network to damage one’s life and career. Scary? Absolutely. So, how do we manage and protect our online reputation? 1. Use social networking sites such as Facebook, LinkedIn and Twitter wisely. As more recruiters are using these sites to screen new candidates, be careful of what message you post on your wall and profile page. If you do it right, these sites can be your great ally. 2. Search your name occasionally and check for the activity that’s connected to it. 3. Set up news feed for your name so you can monitor when and if your name pops up on blogs or other online articles. For example, create Google alerts for your full name so that whenever your name is mentioned in the net, you get an email alert immediately. 4. Watch out what you post on the web, whether it’s a blog post like what I’m doing now or comments made in other sites. Often, the negatives about you can be something you published yourself. Recruiters may just eliminate a candidate based on something that they have said on the web. 5. If something untrue is said about you, take action immediately. Ask the site owner to remove the article as it’s still out there. 6. Create a google profile since google dominates the search engine market This new tool is recently launched by Google to let us create profiles and direct people to this profile when someone conducts a search. It gives you the opportunity to allow people to get the first-hand knowledge about you and to push other results about you that may be embarrassing farther down in the search list results. 7. If you do not wish to have the world see your tweets or photos, opt to keep your account locked or refine your viewing permissions. Some of the ideas above are from Forbes.com. Bottom line: Use common sense when you surf on the net as each activity help to create your online reputation. Are you happy with the results people get back when they Google your name? I must admit I've so much to learn as I blogged about this subject. Heard of “Kurzarbeit”? It’s a German word that translates to “short work”. German policymakers are rejoicing at present because their strategy of curbing unemployment, or at least minimizing its spread is working well, via “kuzarbeit”. Firms that face a temporary decrease in demand avoid shedding employees. Instead, they cut down the working hours. If hours and wages are reduced by 10% or more, the government pays workers 60% of their lost salary. This certainly encourages firms to use across-the-board reductions of hours instead of layoffs. The benefit of this program is that workers still have jobs. Laying-off workers should always be the last resort but employers usually do not have much choice when sales and profits are down. But with government intervention, employers are more willing to retain workers. Employers would prefer all else being equal not to lose staff because when recession ends, they need to incur large hiring and training costs. Of course, the other factor is staff morale – when there are lay-offs, it affect not only those that had left but people who are staying too. Kevin Hasset was right to say that US should learn from their friend across the Atlantic. With the recent US unemployment rate rises to 10.2%, surely whatever job-creation programs they had in place are not working effectively. It’s never too late to change and adapt to this work sharing model. Over this part of the shore, Malaysian policymakers and employers can keep this model in mind too. We may need to adopt it one day. It's Bonus Time...Or Is It? Civil servants got their answer loud and clear. No bonus equals to a lot of things to many people – it can mean no holiday that you’ve planned some time ago, no I-Phone that you had been eyeing all these while, no year-end party and to some, it basically boils down to deep sighs and making quick plans to ensure enough money is saved to get the necessities for children’s new school next year. I hope they know that the company is not doing that well this year, and should not expect any bonus. I’m in the midst of preparing the content of a career talk to be held on this coming Wednesday and Thursday. One of the topics is about the mistakes that job seekers commonly make in constructing their resumes. Although the audience of the talk is fresh graduates, I realized many job seekers with experience still commit such mistakes. • Include negative information in your resume (for example: if you were not paid for a freelance job, you don't have to make the fact known in your resume. That should only be mentioned during interviews if the subject was ever brought up). • Not enough white space – text extends from margin to margin, and there are no blank lines between sections, paragraphs and bullets. 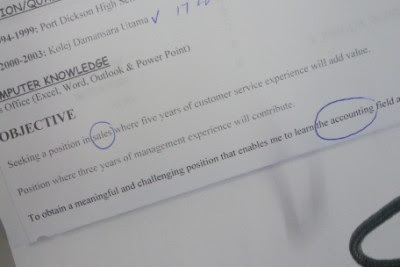 • A resume with spelling mistakes – this is most common! The least you want to achieve is to leave the impression that you are careless or not serious enough. Best advice: Get someone to proofread your resume- whether it’s going to be in soft or hard copy. If necessary, enlist the help of a friend with strong English skills to proofread your documents before printing and sending them out.